Professor Liang primarily concentrates on exploring the biological functions and mechanism of action of biological active molecules for development of preventive and therapeutic medicines. Besides molecular and cellular biology studies, Professor Liang also likes to utilize his broad experience in immunology, pharmacology, biochemistry, regulatory affairs, project management of research and development as well as patent filing, licensing and marketing, to contribute to the build-up of biotechnology industry in Taiwan through focusing on profitable projects and establishment of a stream-line cooperation system among government institutes, universities and bio-pharmaceutical industry. Professor Liang was one of the pioneers in proposing that glutathione may play important role in regulating the cellular effects of cytokines particularly IL-2 and affecting the well beings of AIDS patients. He was also the first to produce anti-TNF monoclonal antibodies. Professor Liang has worked on many projects, most notably interferons, interleukins, GM-CSF, thymidylate synthase, metalloproteinase-2, tissue inhibitor of metalloproteinase-2 (TIMP-2), CpG-ODN and heat shock proteins. 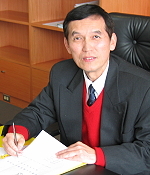 Besides research, Professor Liang has undertaken technology licensing, legal affairs, incubation center and congress lobbying, some good examples are as follows: he set up Office of Public Affairs at Academia Sinica to promote protection of intellectual properties and technology licensing in 1998, Academia Sinica has since filed more than 400 patent applications, got 120 patents issued, signed about 300 licensing and collaboration deals worth more than NT$800 millions. As about 70% of the patents and deals are in the field of biological sciences, Academia Sinica has become the locomotive that pulls the research and development of biotechnology industry of Taiwan. Using the success of technology licensing at Academia Sinica as a good example, he helped the National Science Council to persuade many universities in Taiwan to set up their own technology licensing offices. Liang, S.-M., Peng, J.-M., and Liang, C.-M., 2005 Apoptosis-inducing polypeptides. Application number US2005058654. Johnston, P.G., Allegra, C.J., Chabner, B.A., and Liang, C.-M., 2001 Monoclonal antibodies specific for human thymidylate synthase. US 6221620. Liang, C.-M., Turner, N.A., and Witiak, D.T. (1993) Treatment of vascular leakage syndrome and collagenase induced disease by administration of matrix metalloproteinase inhibitors. AU4373993 9. Johnston, P.G., Allegra, C.J., Chabner, B.A., and Liang, C.-M., (1992) Monoclonal antibodies specific for human thymidylate synthase. CA2109086.